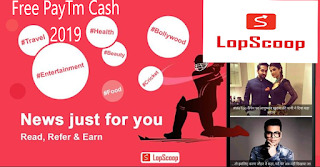 Hello friends, Today I am going to introduce to you one of the best free PayTm Cash App 2019 in India called Lopscoop. You can earn some amount of money with this app by reading news, inviting friends, sharing news, sharing videos and fulfilling task daily. Lopscoop is great app to earn extra money but I don't know how long it will pay. As long as it is giving money take advantage of it. In case of it stopped giving money I will mention in this post. Before we install Lopscoop let me introduce what is Lopscoop? Lopscoop is a Media and Entertainment Platform by Moppomobi; that is responsible for generating news, information and updates on Bollywood and Hollywood, Entertainment, Relationship, Lifestyle, Humour, Sports, Food, and More. Lopscoop is India's best news app it provides trending Hindi news, latest Tamil news and breaking news in India. Lopscoop provides cash rewards, join and earn PayTm cash by reading news, sharing news, sharing videos, inviting friends and completing daily task. In this post I will tell you how to use Lopscoop? how much I can earn from Lopscoop? and how Lopscoop earns money? Till today, there are more than 5,000,000 India users are using Lopscoop. They are earning PayTm cash by reading news, sharing news, sharing videos, inviting friends and completing daily tasks. The best way to earn money from Lopscoop is inviting friends and completing daily tasks. If you want to earn more than you can read news, watch videos and more. In this post I will tell you A to Z about Lopscoop. Installing Lopscoop : As you know, open playstore type Lopscoop then install. If you want to get reward then install from someone's referral link install now to get reward. After installation is done sign up to Lopscoop. 1. Can you see the Receive symbol at the top right? Click on it to get coins. You can earn coins by clicking Receive every 5 hours. 2. When you open Lopscoop App you will see the list trending news click on it until you get rewards. Open the pages one by one to get more coins. 3. Can you see the 10 Rs symbol? Click on it then invite your friends through whatsapp, facebook and other platform. When your friends install through your link and signed up you will get 10 Rs from each friends in your Lopscoop instant money. 4. At the bottom, click on earn. Here you will see Check In Newbie Task, Daily Task, Share Content, Read Content, Invite friends and share income. Check in see at the top of your page click on check in to get coins. You will get to 1 click per day. Newbie task means a task for new users and it is one time task. In newbie task you can earn coins by completing your profile, joining Lopscoop Facebook group, filling invitation code, binding email, subscribing channels etc. Daily task is a task you can perform any time In daily task you can earn coins by sharing content, reading content, inviting friends and sharing income. Share content means earning coins by sharing videos, news and more through whatsapp, facebook and other platform. Read content means earning coins by reading news. You can earn some amount of money by reading news. Sharing income means share your income through whatsapp, facebook and other platform to get coins. Things to know : Most of the Lopscoop users do not waste their time using Lopscoop. They just perform four daily tasks : 1. Invite friends through 10 Rs symbol and earn instant money. 2. Open Lopscoop every 5 hours then click on Read at the top right to get coins. 3. At the bottom click on earn after that click on invite now then open box and earn coins. 4. At the bottom click on earn then see at the top click check in to get coins. How to check balance : At the bottom click on My here you will see Coins, INR and Instant money. Coins means the coins you have eraned click on coins and then convert it to INR. INR means the money you have earned using Lopscoop. You need minimum 300 INR to withdraw it to your PayTm account. Make sure bind your PayTm account with Lopscoop before you withdraw. Instant money means the money you have earned by inviting your friends. You can withdraw it any time no minimum payout required. How much I can earn from Lopscoop? You can earn 1000 Rupees per day using Lopscoop by inviting friends, reading news, sharing content and performing daily tasks. When you open Lopscoop app you see the lots of advertisement. Advertisers pay money to Lopscoop for advertising their products and services.